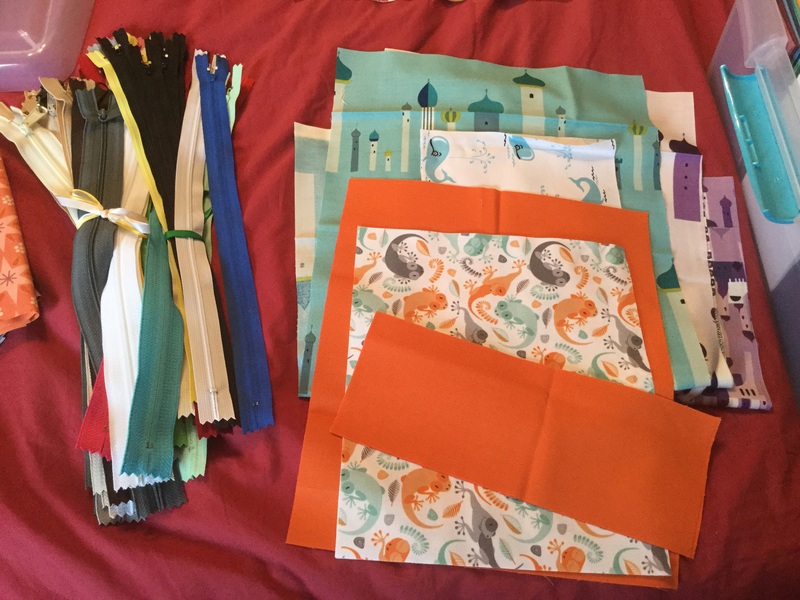 Linking up with WIP Wednesday today. Why so much piece-work? 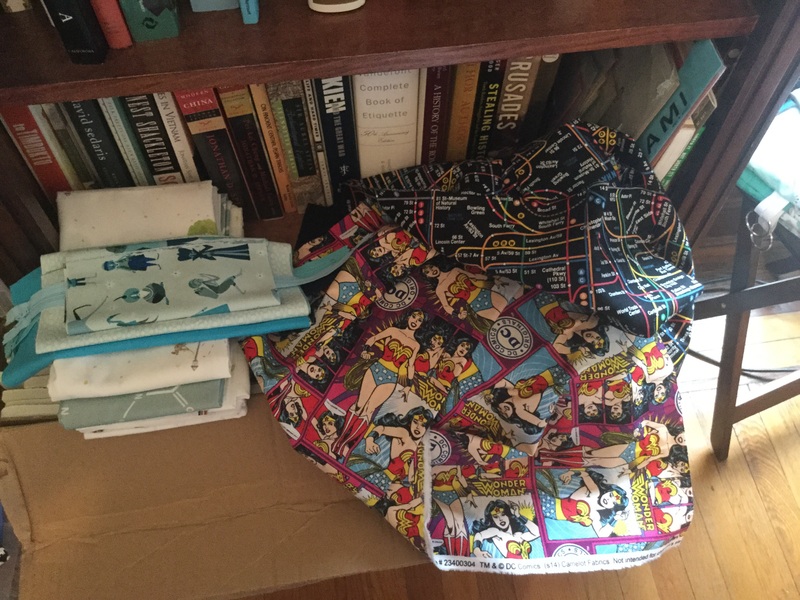 Well, I’m churning out bags for my Etsy shop! After all, fundraising through sales only works if there are things to sell. All sales from my Etsy shop in September and October go toward a donation to the Johns Hopkins University Center for Talented Youth Scholars program, which sends bright kids to college classes, or to a summer 3-week academic program, as well as matching them up with mentors. It’s an excellent cause, focused on families who need the financial assistance, and I’m delighted to be able to help even a little bit. 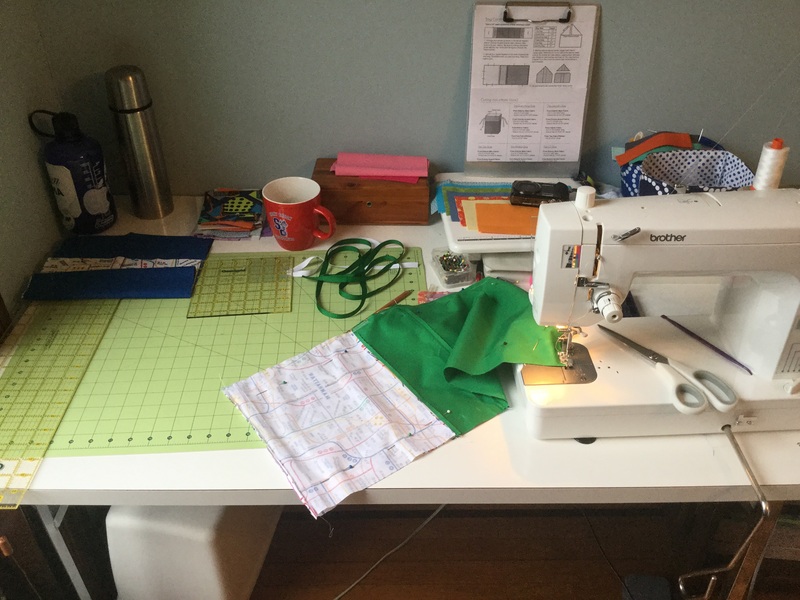 Use code “KSQREADER” for a discount on anything you see in my Etsy shop — and feel free to message me, email me, or PM me on Ravelry (AlisaB) if there’s something I can make up custom for you! I FINALLY finished my Penny Patch quilt. Rachel at Stitched in Color started a quilt-along about a year ago and I cut fabric and stitched a quilt top and even machine quilted the whole thing and then… well, then I got hung up on binding it. 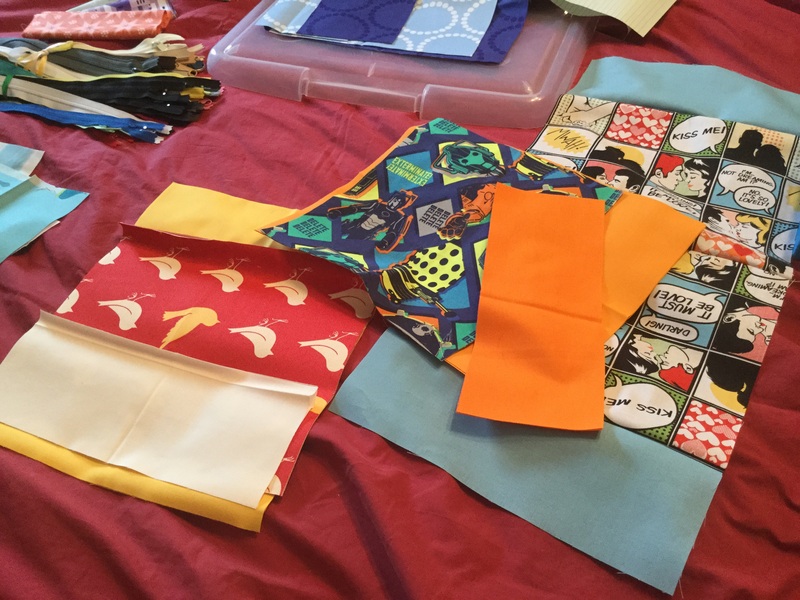 I’ve also been cleaning out my closets, and discovered that I have a lot of quilts that I’ve finished that I just have no use for — they don’t match my personal aesthetic, I made them just to make them, or they’re for babies, and I don’t have a baby. So I’ve put them on Etsy. Longtime blog readers will recognize two quilts I made in 2012. If you like one of these, and use the code KNITSPINQUILTREADER, you’ll get 10% off. As before, all income in September and October of 2015 go directly to a donation to the JHU CTY Scholars program! Edited to add: linking up to TGIFF! 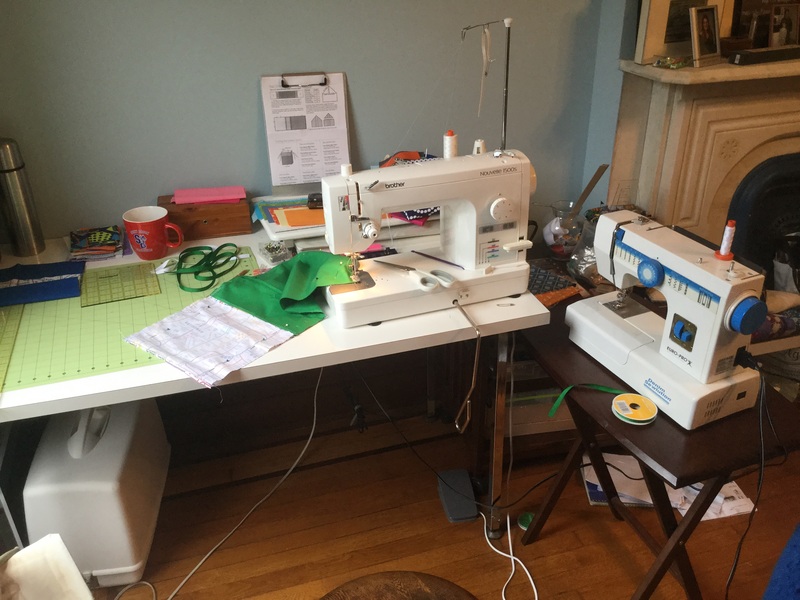 Author AlisaPosted on September 23, 2015 September 25, 2015 Categories Fundraising, QuiltingTags baby quilts, finished quilts, finished!, penny patch quilt, quilting, STEM fundraiser2 Comments on Finished Penny Patch Quilt! 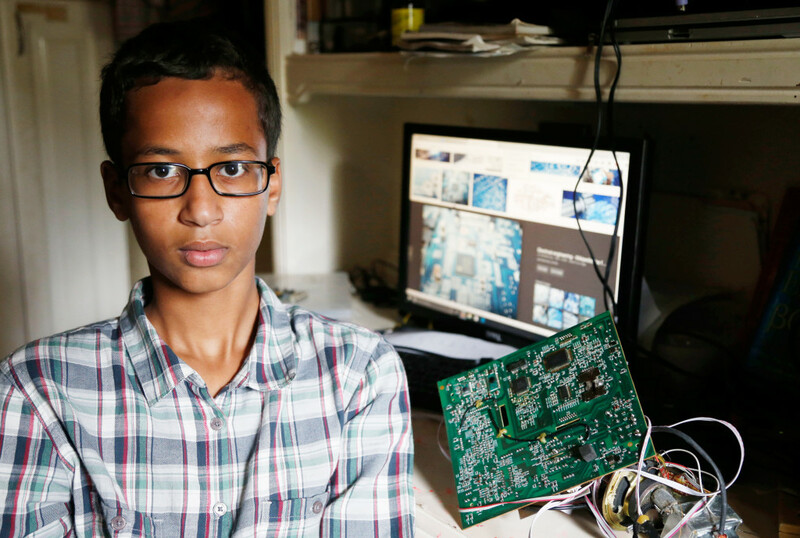 I’m sure by now you’ve all heard about Ahmed Mohamed, the Irving, TX 9th-grader who took a home-made clock to school and was arrested for a bomb, then charged with making a hoax bomb — even though he only ever called it a clock. Ahmed has received a huge outpouring of support on social media — just check out #IStandWithAhmed on Twitter — and invitations from the President, NASA, and too many other places and people to count. But there are still far too many other children in the USA who face systemic inequalities and prejudices that get in the way of them making home-made clocks or learning about biology, or becoming engineers. Helping Ahmed is the first step: helping correct some of the educational barriers is another step. That’s it! 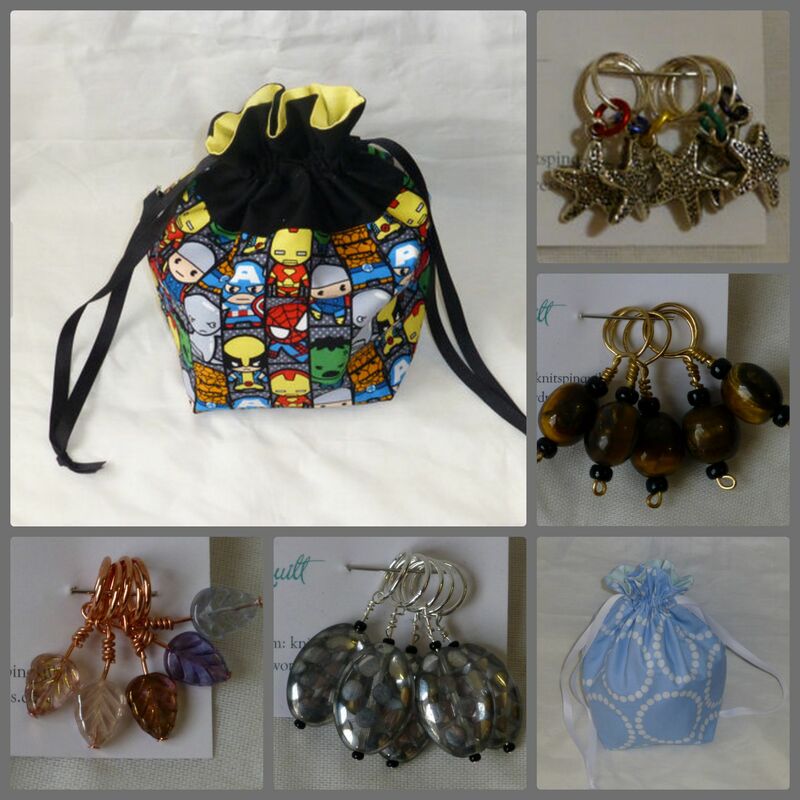 You get stitch markers or a project bag or earrings or handspun yarn, and I donate the full amount you paid toward scholarships for low-income children to go to the Center for Talented Youth (CTY) summer program run by Johns Hopkins University. So far, I’ve raised $133.00 – I’m hoping to hit $250. I’ll put an image in the sidebar, and together hopefully we can help send a kid to CTY to learn that there are lots of other geeky, talented, academically-minded kids just like them, regardless of their family’s income.